Karen Millen fall/winter coat, Jardin des Tuileries, Paris, France. Photo: Nina Shaw. Image©www.thingstodot.com. Karen Millen is one of my favorite fashion labels for tailored styles in coats and jackets. Every time I am in London, I try to pick up at least one outfit from the local KM store to add to my wardrobe. It is even better if I can make a trip to the KM outlet store in Bicester Village. They have an amazing collection of styles sold at reduced prices. I bought the wine coat featured in this post from their outlet store. I was going to Paris for the fall and the color was perfect for the changing mood and the weather. Besides, the moment I tried the coat on, I knew I had to have it! I styled it with suede boots also from Karen Millen and a black Burberry bag. 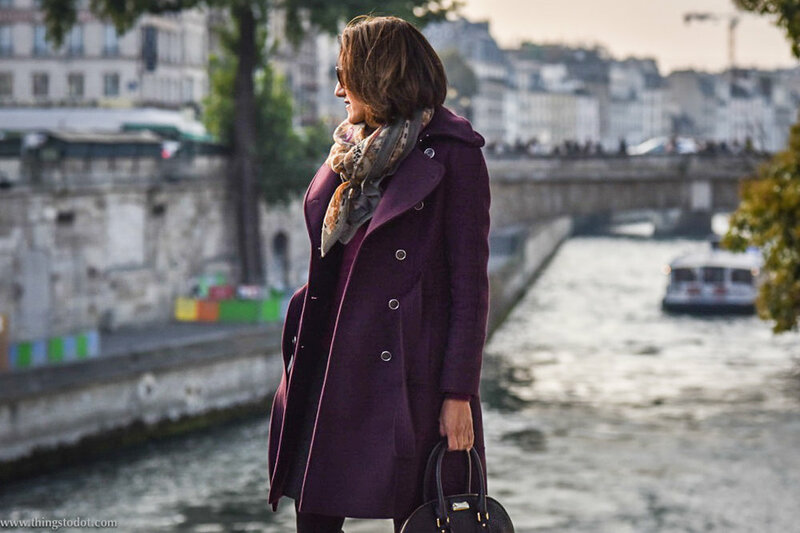 In this post, I am wearing the coat at three very beautiful places in Paris: Jardin des Tuileries, Eiffel Tower and the Notre Dame. It was a beautiful day with the sun shining brightly and golden leaves everywhere! Autumn is really one of my favorite seasons! Karen Millen fall/winter coat, Burberry bag, Jardin des Tuileries, Paris, France. Photo: Nina Shaw. Image©www.thingstodot.com. Karen Millen fall/winter coat, Karen Millen suede boots, Burberry bag, Jardin des Tuileries, Paris, France. Photo: Nina Shaw. Image©www.thingstodot.com. Karen Millen fall/winter coat, Eiffel Tower, Paris, France. Photo: Nina Shaw. Image©www.thingstodot.com. Karen Millen fall/winter coat, Notre Dame, Paris, France. Photo: Nina Shaw. Image©www.thingstodot.com.